The P3 Power Boost » P3 Pearl Story – Change is Good, Balance is Better! P3 Pearl Story – Change is Good, Balance is Better! We’ve all heard the buzz term; balance, work life-balance or something like that. It seems as women, we’re always in the mode of trying to find that happy medium where we’re able to somehow take care of ourselves and take care of others. We’re on a constant quest to have it all; it isn’t always easy but we try. So, I took myself on a journey to interview a woman who seems to have found that balance in her life and I thought you would enjoy her journey. I had the privilege of sitting down to talk with this amazing woman who has a personality bigger than life. Possessing a small frame and a quiet demeanor, she fills a room with joy when she’s living her passion. I met her on the set of the My Carolina Today show where she’s a co-host and I was struck by her presence – so welcoming and warm. I couldn’t help but want to know more about her. 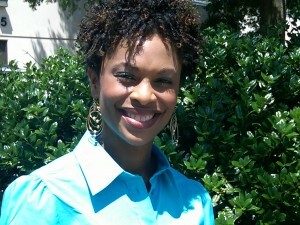 This P3 Pearl is Valonda Calloway. For me, Valonda embodies balance; the balance all women are striving to find. But after spending time with her I found out it wasn’t always easy for her to balance the many roles she has. She’s a community leader, mentor, television show host, wife, mother and friend. These are all pretty big responsibilities that require stamina, dedication, and commitment. Valonda shares her struggles of balancing life and the moment that she overcame the internal battles we’ve all had to face: when to say “no”, ask for help, and take new inventory of life. She takes us on a journey of the day her outlook on balance changed. She was and still is a dedicated, hard working woman, but the day her outlook changed, so did her actions and reactions to life. Sit back and enjoy my candid interview with Valonda Calloway. She opens up about the joy of having fun, working, being a mom and mentoring young girls. She is balancing it all and you’ll find just how possible it is for you too!…Lisa Thomas, President of The P3 Group, Inc.
Great interview with Valonda Calloway.